All of us can use a break from our sometimes hectic lives and although it can get more difficult each year to find the time to experience this much needed reprieve, the slowing down in life for a couple of days allows you the opportunity to recharge their batteries and enjoy some of the finer things that life has to offer. Although there are many travel destinations that this can occur, placing the proper pe rspective on modern day life can be best accomplished through the appreciation and understanding of what it took to for American to reach it’s current status. Taking a look back at United States history is one great way for individuals to regain this perspective. To achieve such perspective, there is no better place to visit than a little town in Virginia called Colonial Williamsburg that operates on the belief that “the future may learn from the past.” Located in the historical triangle district of Southeast Virginia that includes Yorktown and Jamestown, Colonial Williamsburg is a living historical museum where visitors can witness colonial life first hand in the town where American democracy was born. The town of Williamsburg was founded in 1693 the same year that the second oldest university in the United States, the College of William and Mary was established, an institution that has educated some of America’s best leaders including George Washington, Thomas Jefferson and John Marshall. Based on the historical significance of Williamsburg, the re-creation of Colonial Williamsburg was undertaken by W.A.R. Goodwin and John and Abby Rockefeller in the early 20th century to restore the town of Williamsburg to its 18th century appearance. During the project many of the destroyed buildings were rebuilt and many others were restored to look as they did when Williamsburg served as Virginia’s capital. As a result of the work, the living Colonial Williamsburg museum was created. This museum contains historical buildings such as the Capitol building, Governor’s Palace, Bruton Parish Church and Raleigh Tavern that are all open throughout the year for the public to tour. This Williamsburg experience is further developed by the reenactment of the daily lives of Williamsburg residents in the 18th century. This reenactment allows visitors to experience firsthand how colonial residents lived during the development of the United States. Colonial Williamburg also offers historical themed days throughout the year that recapture some of its most historical events. These events include the founding of Williamsburg, the occupation of Williamsburg by British forces and visits to Williamsburg from historical figures such as George Washington during the 18th century. 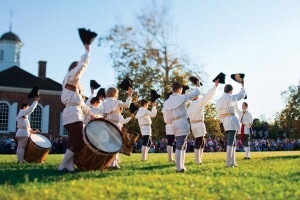 With the historically accurate re-creations along with the restored 18th century buildings, Colonial Williamsburg provides its visitors a unique historical experience that both engages and informs as they tour the beautiful Southern Virginia countryside. Beyond the living re-creation of 18th century, Colonial Williamsburg also has two historical art museums that display a wide range of antiques and folk art that were constructed in the 18th century. The Abby Rockefeller Folk Art Museum was designed in 1957. At that time, the museum contained Abby Rockefeller’s donated folk art collection that she had previously donated to both the Ludwell-Paradise House in Williamsburg, the Metropolitan Museum of Art and the Museum of Modern Art. The 429 piece collection of Abby has since grown to include over 3,000 pieces. Another popular museum on the Colonial Williamsburg grounds is the Basset Hall, an 18th century frame house that was built somewhere between 1753-1766. This historical house was named after Martha Washington’s nephew Burwell Basset and has housed historical visitors such as George Custer during the civil war era. During the initial restoration stages of Colonial Williamsburg, John and Abby Rockefeller resided in Basset Hall. Since that time,, Basset Hall has been open to the public to view and gives its visitors a unique perspective on how upper class society lived in the 18th century. Colonial Williamsburg’s hotels blend comfortable accommodations with convenient access to the historic area, recreation, dining and more. The hotels are favorites of leisure travelers from families to couples, and extend exclusive program offerings to hotel guests. Top-notch customer service and attention to detail are consistent across the properties. During your trip to this history rich area, you’ll encounter anything from on-site magic shows, evening storytelling programs and cookie decorating, to special historic area programming, a gingerbread village with a moving train (holidays) and exclusive access to Thomas Jefferson/other 18th-century personalities. The Williamsburg Inn – The intimate and elegant Williamsburg Inn was built as a home away from home for friends of John D. Rockefeller and Abby Aldrich Rockefeller. Today, the hotel continues to welcome leisure guests and esteemed dignitaries from all over the world. Marble bathrooms, spacious bedrooms and fresh flowers in each room are some of the signature components of rooms at the Inn. The Williamsburg Lodge: At the folk-art inspired Williamsburg Lodge, the ambiance of a southern family home prevails. One of the two original hotels envisioned by John D. Rockefeller, the property now consists of eight buildings, interconnected by sheltered walkways. Rooms are large and comfortably accommodate families. Williamsburg Woodlands Hotel & Suites: The Woodlands is Colonial Williamsburg’s family hot spot. With daily continental breakfast and an entire recreation center complete with an 18-hole mini golf course, volleyball, shuffleboard, ping pong, an outdoor pool, and more, the hotel is always bustling with families. Colonial Houses: The Colonial Houses (Historic Lodging) offer guests the opportunity to immerse themselves in the experience, providing the most convenient access to Colonial Williamsburg’s Historic Area. Located on Duke of Gloucester Street and on the adjacent side streets, these original and reconstructed 18th-century buildings are Colonial Williamsburg’s equivalent of oceanfront rooms. Providence Hall: Located adjacent to the Williamsburg Inn, the rooms at Providence Hall overlook the Golden Horseshoe Golf Club or Colonial Williamsburg’s tennis courts. These sunny rooms surrounded by nature feature contemporary design with oriental accents. The Golden Horseshoe Golf Club consists of 45 holes (Gold course, Green course and the Spotswood), two restaurants and a pro shop. I’ll be doing a detailed write-up on each course in my next post, but the one thing that to this day, sticks out in my mind is how fast the greens on these courses were. 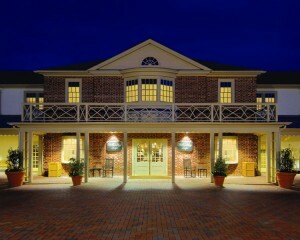 The Spa of Colonial Williamsburg is a 20,000 square-foot facility with a fitness center, indoor and outdoor pools, locker room facilities, and individual and couple treatment rooms. The Spa’s five signature treatments reflect wellness practices of the corresponding century. 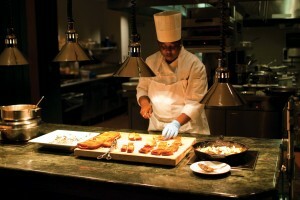 A new Spa Cuisine menu complements each signature treatment. 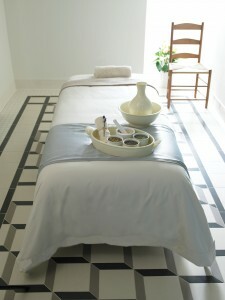 The Spa also offers a brow bar and full service salon, as well as a regular menu of spa services. While I was there, I took advantage of the spa with one of their sports massages after the golf courses beat me to within an inch of my life and wow what an experience. Everything from the initial check-in to the post massage recovery area was amazing. I’ve never felt so pampered as I did during the spa treatment. The sports massage was a blend of your traditional massage treatment with some deep muscle stretches that can cure even the deepest of post-golf aches and pains. Colonial Williamsburg offers guests an array of dining options, from the elegance of the Regency Room to the excitement of a tavern. At the Williamsburg Inn: The formal Regency Room and less formal Terrace Room fuse regionally-inspired contemporary menus with seasonal ingredients. Chef de Cuisine Travis Brust regularly introduces special menus, while long-time classic favorites such as Dover Sole and Chateaubriand are available on weekends. The Regency Room boasts windows on three sides and a classic elegance, while the Terrace Room offers a more casual environment. The Restoration Bar and its adjacent terrace is the ideal location for an afternoon cocktail or after-dinner drink. At the Williamsburg Lodge: The comfortable Lodge Restaurant infuses international flavor palettes with Southern favorites. Whether looking for an elegant prix-fixe menu with wine pairings for every course or a casual meal with the family, the Lodge Restaurant has something for everyone. Friday night’s Seafood Feast – a weekly must-see – boasts carving stations, sushi and prepared favorites, and the regular a la carte menu changes frequently. At lunch, full-serving fruit smoothies are a terrific add-on. Huzzah! BBQ Grille: The latest addition to Colonial Williamsburg’s contemporary dining offerings, Huzzah! BBQ Grille offers barbecue favorites with an international flair. From smoked chicken and pulled BBQed pork sandwiches, to homemade baked beans and a carne asada salad, to short ribs and salmon, Huzzah! BBQ Grille has something for everyone. Tavern Dining: Colonial Williamsburg’s Historic Taverns give guests an opportunity to enjoy contemporary menus in an 18th century setting. With strolling musicians, storytellers, and characters of the past, tavern dining is entertaining for all. Christiana Campbell’s Tavern, Josiah Chowning’s Tavern, Kings Arms Tavern and John Shield’s Tavern all give guests a taste of what local cuisine would have been like during the 18th century. Taverns are open on a rotating schedule for lunch and dinner. Christiana Campbell’s Tavern is by far my favorite restaurant in Colonial Williamsburg. We went there for dinner and it was literally a candlelight meal. Christiana gave a speech about how she came to possess the tavern and she put on quite a convincing act. There was a fiddler playing from table to table whilst we were there which was incredibly cool. They also have some really good beers there, that are locally brewed. 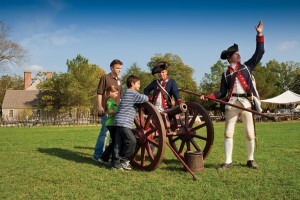 Whatever your vacation desires, family friendly Colonial Williamsburg offers a wide range of activities that will engage its visitors each day. With its convenient location near Interstate 64 in Southeast Virginia, your an hour away from three major airports, making travel to and from Colonial Williamsburg pretty convenient. Interested in taking a trip? Save up to $525 when you book your flight and hotel together at Expedia.com! Colonial Williamsburg is without a doubt my favorite place to visit. So much to see and learn, even after many returns. My family loves Colonial Williamsburg as well. I have been going there for the past 35 years or so (ever since I was a boy, and my parents did the family vacationing there; I’ve continued that tradition with my wife and children). There is so much to see and do there, and learning all the history is such an enriching experience. Since I work in higher education and in a past life I’ve done computer game development, I’ve developed a game idea to teach the history of Williamsburg using the Interactive Fiction format. Feel free to take a look at the Kickstarter project at http://tinyurl.com/75754ka. I’d love to reach new generations of students this way.